NEW YORK (AP) -The Philadelphia Flyers got even with the New York Rangers with some pretty passing. They won it with a few strokes of good luck. Danny Briere scored the tying goal in the third period and Mike Richards netted the winner 2:16 into overtime for the Flyers, who rallied to their fourth straight victory by topping the Rangers 2-1 Tuesday night. "I was going to go forehand and try to go upstairs, but he was right there," Richards said. "The puck kind of hopped up on me and just trickled over his pads. We got a little bit lucky." Avery had swooped around Philadelphia's net and back out toward the blue line when his pass into the middle was picked off by Smith. "I'd say it's more disappointing how it happened," Avery said. "I make a terrible play in the end and they go down and score. It just wasn't a very good play, that's for sure." That mistake moved the Flyers within one point of the sixth-place Rangers in the Eastern Conference playoff race. Before this winning streak, Philadelphia was in the midst of an 0-2-2 skid that threatened to knock them out of the postseason. With a game at slumping New Jersey on Friday, the Flyers are setting their sights on the fourth-place Devils, too, who lead them by just three points. "Even when we lost a couple in a row to Toronto, for us it was looking up, looking to catch Boston and maybe even the Rangers," Briere said. "We still believe we can move up." The Rangers were 6-0-1 in their previous seven home games, and finished the season series with the Flyers 5-1-2. "We lost a big point," Rangers coach Tom Renney said. "That's the most important thing to recognize, and how we lost it as much as anything." Briere scored his 30th goal 7:32 into the third period to tie it. The Rangers tried to protect a 1-0 lead they earned just 1:41 in when Jaromir Jagr hit the 20-goal mark for the 17th straight season. Martin Biron made 31 saves in the victory. Lundqvist finished with 23. New York is two points behind Ottawa and New Jersey, who are tied with 91. The Rangers have a five-point cushion over Washington, the team just below the playoff cutoff. "I just worry about making the playoffs. That's the way I look at it," Jagr said. "Of course you want to finish high, but first you have to make the playoffs. There are some teams now chasing us. That's OK."
The Rangers played for the first time this season without leading scorer Scott Gomez, who injured his ribs early in Friday's shootout loss at Philadelphia. He is day to day. New York's offense that had scored 10 times in three games sure could've used the center's playmaking. Again the Rangers got nothing from its power play that failed on four chances and has clicked for a goal only once in 29 chances over nine games. Jagr's goal looked as though it might stand up as New York held the Flyers to only 12 shots through two periods. Even Philadelphia's No. 2-ranked power play couldn't generate much. The Rangers killed off Colton Orr's roughing penalty early in the third, making the Flyers 0-for-3 with the advantage, but they couldn't stop a pretty passing play at even strength that produced the tying goal. Jaroslav Modry kept the puck in at the left point and slid a pass down to Briere, who moved the puck to Vaclav Prospal in the middle. Prospal quickly sent a pass back to Briere for the goal. "I was ready for it, but it kind of still surprised me because I saw him all alone," Briere said of the return pass. "In my mind I was thinking, 'You've got to score, you've got to score.' Then I see the puck coming back." The Flyers' big free-agent pickup hit the 30-goal mark for the second straight season, third overall. 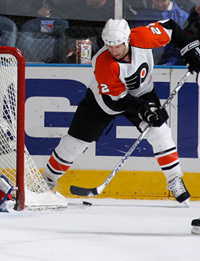 Early on, Jagr outworked defenseman Kimmo Timonen and dug the puck off the end boards to the left of Biron. He moved to the bottom of the right circle and quickly snapped a shot that beat Biron at 1:41. It was Jagr's second goal in three games, following a 24-game stretch in which the Rangers captain scored only three times. Jagr has scored in consecutive games just four times this season - including two three-game streaks. Notes: Jagr's 641st goal broke a 12th-place tie with Dave Andreychuk on the NHL career list, and his 1,591st point moved him ahead of Phil Esposito for ninth. ... Petr Prucha took Gomez's spot in the Rangers lineup, playing for the first time in 17 games. D Paul Mara returned after a 12-game absence (facial fracture). He replaced Michal Rozsival, who sat out due to a leg injury.